Johnnie Taylor, a contemporary of Al Green and Smokey Robinson, is from the era of R&B when the initials really stood for rhythm and blues  a term first applied in the '50s to music with a dance rhythm and blues-based melody. In this case, the term is accurate and not just a convenient label for popular black music. After achieving commercial and artistic success in the '60s and early '70s with his smoldering ballads and uptempo rockers, Taylor got lost in the disco desert of the late '70s. But the '80s, which have marked the strongest comeback yet of the blues, have been as kind to Taylor as the '60s. His latest Malaco release, "In Control," is full of his just-beneath-the-surface passion. As polished as Hollywood's most commercial offerings, Taylor's music is at the same time as authentic in its emotional evocation as the rawest back-country blues. Taylor's own vocal style is, while strongly influenced by the '60s Stax/Volt sound, still all his own. The phrasing is more blues-oriented than that of the Motown crowd, and Taylor takes the time to tell a story rather than rushing through just to finish the song. 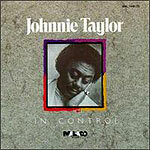 Unmistakably pop-oriented, Taylor's performance on "In Control" still borrows much from traditional gospel (where he began his career) and blues. The strength of Taylor is that, whether delivering a blues or a Top-40-styled pop tune, he brings his Southern musical sensibility to each song, lifting the most banal to a level of artistic integrity that transcends the sometimes limited material on this release. Through sheer strength of performance, Taylor makes any song seem a polished gem. Evidence of this is "It Don't Hurt Me Like It Use To," a slow, easy piece that in the hands of a lesser artist would be just another pop song with a nice hook. But Taylor, sounding like a cross between Johnny Mathis and Sam Cooke, is so effortlessly smooth that the song becomes, well, hip. Taylor shows more of a gospel influence on "I Found a Love." The traditional-style female backing vocals only add to the feeling of gospel inflection of Taylor's own singing. "Got to Leave This Woman" is the only true blues piece on the album, albeit a modern Chicago-style electric blues. With a tight horn section punctuating Taylor's lush singing, the song brings to mind B.B. King. Sliding easily from one style to another, Taylor seems as at home on the Motown-styled ballad "Let's Get Closer" as on the funky "You Knocked My Heart Right Out of Line." One minute his voice is full and lush, and the next he is laying down a near-staccato that would sound at home with the Staples. The only real weakness here (outside some of the song selection) is the lack of track-by-track credits. With several contributors listed for each instrument, it's impossible to know who's playing what on any song. But that's a small complaint  for what this album ultimately comes down to is that Taylor remains one of the best R&B singers around, and this is one of his best releases.